Which colleges and conferences have produced the most NBA draft picks over the past decade? If you’re a top 25 high school basketball player, you’re going to spend a lot of time in your teens sorting mail. Offer letters will flow in from Power 5 schools, national championship favorites and small local colleges trying to sell you on the idea of being a hometown hero. Just look at St. Louis native Jayson Tatum, a unanimous top-three player in the class of 2016. 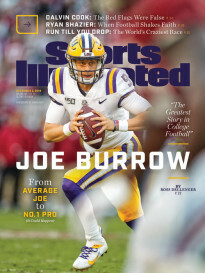 He’s received offers from every school in the country that thought it even had a prayer of landing him, but has narrowed his schools to powerhouse programs Duke, Kentucky, North Carolina ... and St. Louis. Players are forced to weigh an enormous amount of information in making these decisions. Will my family be able to see me play in person? Will my coach stay for more than a year if I do? Will I get to keep my scholarship even if I leave school early? But for top 25 players, the most important question undoubtedly is this: Where should I go if I want to play in the NBA? Let’s start with the widest possible view, the conferences. And let’s set up some ground rules. There has been a ridiculous amount of conference realignment in the last decade, so we made a decision to simplify the data and hopefully come up with some more meaningful information. 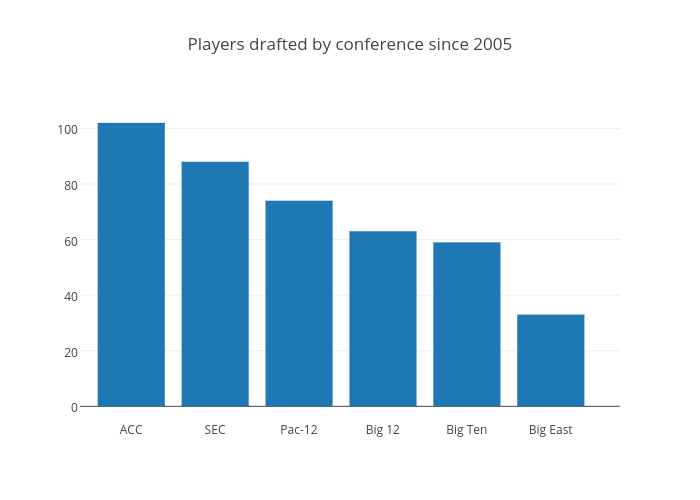 First, we used each school's current conference affiliation when looking back at the past 10 drafts, meaning that, for example, Maryland's draft picks since 2005 count toward the Big Ten, not the ACC. The reason we did this was to get the best possible idea of which conferences now have the best composition of schools that produce NBA draft talent. Second, players were tallied based on the most recent team they played for before entering the draft, so a transfer like Xavier Thames (pick No. 59 in 2014) is counted for San Diego State, not Washington State; and players like P.J. Hairston, who left North Carolina during the 2013-14 season after having his eligiblity questioned and played for the D-League's Texas Legends before becoming a first-round pick in '14, didn't count toward the Tar Heels' total. Without further ado, let's dig into the results. Even without Maryland, the ACC still sends the most players to the NBA—and by a significant margin. We’ll get into the schools more specifically later, but it’s important to note that a big reason the ACC has this kind of advantage because it has three schools among the top 11 at churning out NBA talent: North Carolina, Duke and Syracuse (which arrived in 2013). 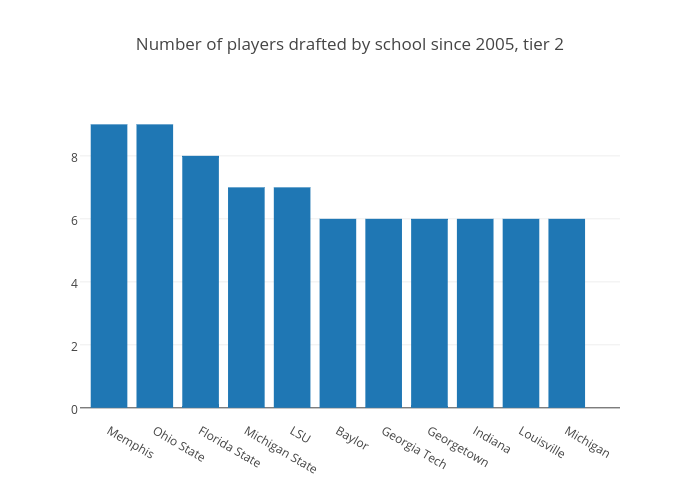 Those three schools account for 42.2% of players drafted in the conference during that decade. Meanwhile, no league has been more lopsided than the Big 12. Kansas has produced 18 NBA draft picks since 2005, 28.6% of all players drafted in the conference, including 2014's No. 1 overall selection, Andrew Wiggins. Even Kentucky—largely because of the run of NBA players produced by Billy Donovan at Florida—accounts for only 25% of the SEC’s picks. Now let’s look more narrowly at the NBA draft lottery. The lottery is composed of the 14 teams that missed the playoffs, and those clubs get the Nos. 1-14 picks in the draft. Again, we pretended as if conferences are composed of the same members through the last 10 years as they are today. This allows us to more effectively evaluate how strong each conference is now. The biggest takeaway from this is that these lines are volatile. No conference has ever put more than five players in the lottery, and because of the limited picks and the availability of elite international players, it’s hard to imagine that number increasing much. 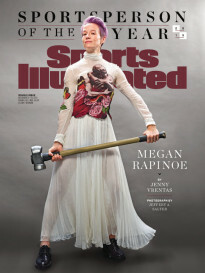 But numbers shift wildly from year to year. 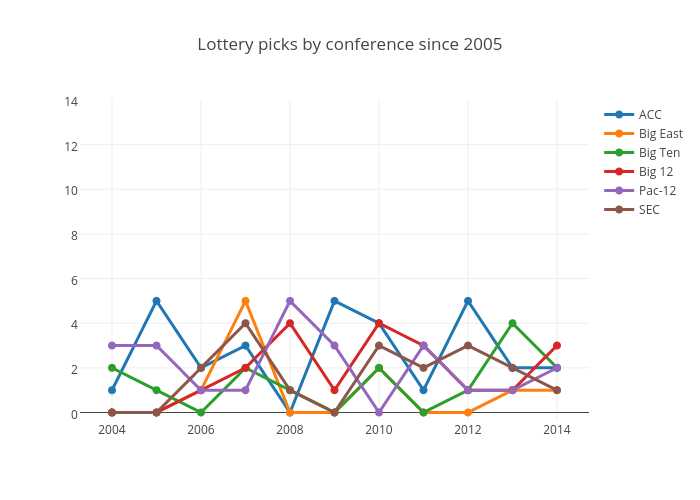 In 2008, the ACC didn’t have a single lottery pick, and then the conference rebounded with five in 2009. Schools in what is now the Big East went from having five lottery picks in 2007 to being shut out in 2008. Manufacturing elite NBA players is a mercurial process. And just as an aside, there’s one interesting note about No. 1 picks during this decade. One—Andrea Bargnani in 2006—was an international player and nine were selected from the NCAA. Of those nine, two were taken from schools that didn’t have another player selected in any NBA draft during the decade. Andrew Bogut, 2005’s No. 1 pick, and Anthony Bennett, 2013’s No. 1 pick, were the only draft picks for Utah and UNLV, respectively, from 2005-14. 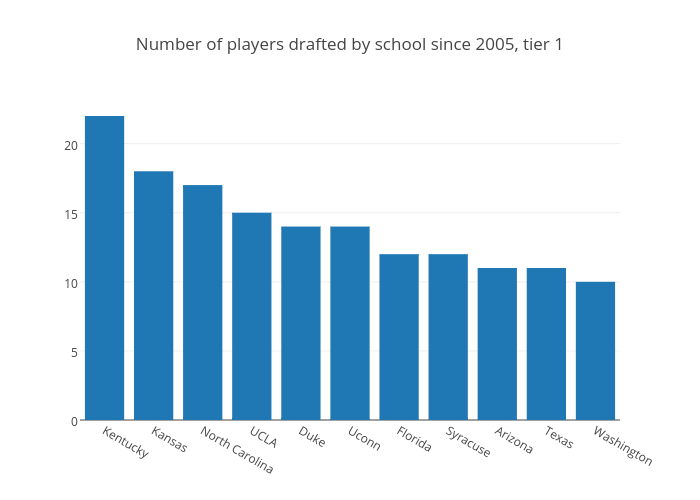 Now let’s narrow our focus again to look at NBA draft picks produced per school since 2005. Eleven schools produced double-digit draft picks during that span. It should be no shock to see Kentucky way out in front with 22 players drafted. No school has done a better job of embracing the one-and-done era (which began with the high school Class of 2006). Among those are a pair of No. 1 overall choices, John Wall (2010 and Anthony Davis ('12). We’ll discuss the Wildcats' success in more detail later, but it’s also surprising to see just how many of those players came from John Calipari’s tenure alone. Bill Self, who has been at Kansas since 2003, has put 18 players in the draft since 2005. ​We don’t have enough data to make any inferences about cause and effect, but it is interesting to note that a common thread among these teams is head coaching consistency. Kentucky was the most volatile over the timeframe, thanks to the departure of Tubby Smith in 2007 and the two-year tenure of Billy Gillispie that followed. But again, the vast majority of the Wildcats' draft picks over the past decade have come in the six years since Calipari took over. Kansas, UNC, Duke, Florida, Syracuse, Texas and Washington each kept the same coach during the time period, and UConn and UCLA only changed in 2013. Arizona went through the retirement of Hall of Famer Lute Olson in 2007 and a rocky period with two stopgaps (Kevin O'Neill and Russ Pennell) before hiring up-and-comer Sean Miller, who has proven to be a force on the West Coast recruiting trail. The most surprising school on the list, of course, is Washington. Despite producing, on average, an NBA draft pick each year since 2005, the Huskies have missed five of the past 10 NCAA tournaments and haven’t made an Elite Eight appearance since 1953. Washington is the only team in this group not to have made at least an Elite Eight run during the time period. The teams on this list have won nine of the 10 national championships from 2005-2014, with Florida, UConn and North Carolina winning two apiece during the decade. Duke, Kansas, Kentucky and Syracuse have also won championships, while UCLA reached three Final Fours and Arizona (3) and Texas (2) made multiple Elite Eight runs. Louisville is the only program that has won a national championship in that period but does not appear in this group. The Cardinal's 2013 title squad featured three starters who would be drafted and a reserve freshman, Montrezl Harrell, who is likely to hear his name called on Thursday. Louisville falls into the second category of teams, which have produced between six and nine NBA draft picks since 2005. You may be surprised to see that Memphis is just behind the big boys, with nine players drafted during our timeframe. You shouldn’t be. Calipari was the team's head coach from 2001-09, but he recruited seven of nine of the Tigers who were drafted from 2005-14. The Calipari recruiting bump is real. Kentucky, of course, is either the best or second best college basketball program of all time, depending on which coast you’re from, but take a look at how the Wildcats fared before and after he arrived. 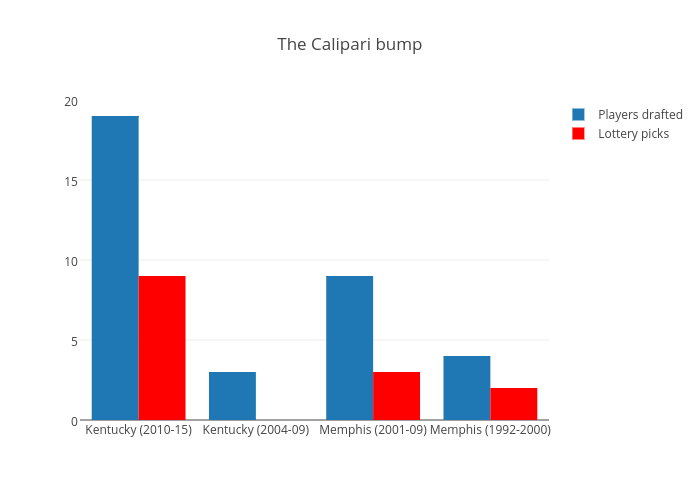 The chart below tracks Memphis’s draft picks in the nine years before Calipari and the nine years of his tenure, as well as Kentucky’s draft picks in the six years before he arrived and the six since. And, of course, the chart below does not include his latest haul, in which at least six Wildcats are expected to be selected on Thursday.